My oldest daughter loves to make bucket lists. In fact, she loves to make all kinds of lists. As summer snuck up on me yet again this year (I think it was the record rainfall we had this spring – it just didn’t feel like summer was ever going to arrive), I began to think about all the things I wanted to enjoy with the kids during this season and what things would top our “warm weather bucket lists” . At the same time, I wanted to think about a “summer schedule” of sorts – what our days would look like and how we would manage the family budget during the most expensive time of the year – at least for us! The last thing I wanted was for our long-term goals to short-change our summer fun and the memories we hope to make as a family. But what I’ve learned is that simple is usually better for everyone! Instead of jam-packed calendars and commitments, I am looking at this summer as an opportunity to make new memories as a family, day by day, moment by (simple) moment. 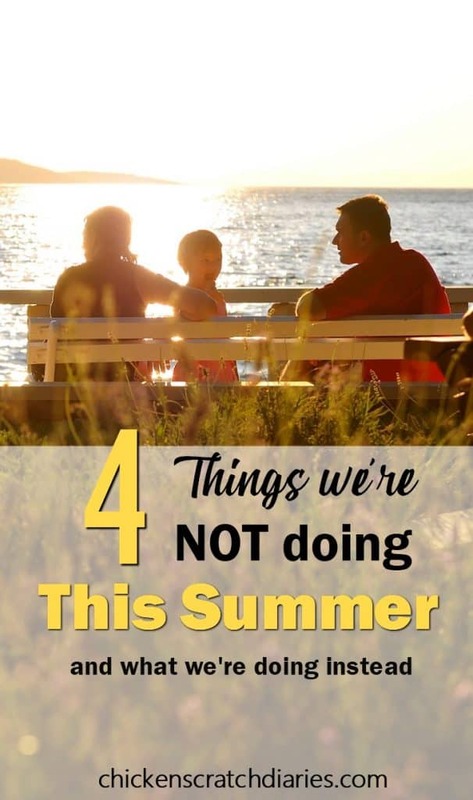 Here’s some of the changes we’re making this summer to stick to our budget and overall goals for our family – while still enjoying every minute of summer! 1. Going on a big, expensive vacation. To be honest, big vacations just haven’t been in our budget for the last few years. It’s part of the sacrifice of me working less hours to have more time at home with the kids. And, we refuse to go into debt to take a vacation. Instead, we are going to enjoy our yearly 2-day stay at a nearby tourist destination and another 2-day stay at the lake later in the summer (also within a few hours of our home). These short stays might sound lame, BUT it really is something we all look forward to. What I like is there’s something for each of us to enjoy; it doesn’t require 42 bathroom pit stops and endless fighting over electronics to get there; and it’s a long enough break from the mundane without being overly exhausting. We do dream of taking a (longer) beach vacation – maybe as soon as next year, budget willing! But for now we’re focusing on the big picture and we’re okay with that. Who doesn’t really like a tidy house? But, I have to be realistic. Six people live in my house. I have a job. I also work at home. I’m busy and we’re messy! So I’m choosing to overlook some of it this summer. I may have to literally close my eyes when I walk into my son’s room to refrain from lining up his stuffed animals and making sure the trucks and tractors are all in their designated boxes. And I’m already making progress – I skipped the dinner dishes a few nights this week! Go me! The reason behind all this madness? I want more time to enjoy the small things – taking walks, watering and watching the plants (and kids) grow, playing Wiffle ball in the yard. The stuff that you can’t enjoy all year around. Organizing closets and having a sparkling kitchen every day of the week can wait until winter – when there’s nothing else to do. 3. Sleeping in every chance we get. Now, this may seem contrary to the laissez-faire attitude in #2 above. But here’s what I’ve discovered: we’re actually happier people when we stick to somewhat of a schedule. The first week or so of summer break, I only set my alarm on the days we had to be somewhere. We went to bed late and slept late and just moved back our routine a few hours. I kept wondering why, after getting extra sleep, was I feeling more irritable and exhausted than usual? The kids were crabby, uncooperative and I had a feeling the change in schedule was partly to blame. My kids seem to thrive on having a routine, so I think we’re going to keep setting the alarm this summer and see how it goes! Sure, there will be late-night fireworks in July and outings that will require some sleeping in and catch-up naps, and that’s ok. But I think there’s something to be said for having a little structure and a plan for each day- even in the summer. 4. Signing up for every camp and summer program on the planet. Hear me out, moms. I know you love your kids and want them to stay busy, engaged, and explore their interests. You want them to be good at sports/music/science and hone those skills that could possibly earn a college scholarship someday. We all do and there’s nothing wrong with that. However, let’s find some balance. Our parents and especially grandparents were much better at this than we are. We sign up kid #1 for basketball camp, then volleyball camp, church camp (all good things!) …throw in a music lesson or two …pretty soon your 11-year-old has a load that would overwhelm a freshman college student! Then it all starts over with kid #2 and however many kids you have that are old enough to be let out of the house for extended periods of time. Suddenly your life becomes an endless cycle of Google calendar notifications, running the mom-taxi all over town and way more Sonic cheeseburgers on the menu than should be legal. I see the Facebook posts all the time and I hear other moms lamenting about this problem. We’re all stressing about having to take our child here, there and everywhere because they committed to it. But truly, that’s on us, moms! 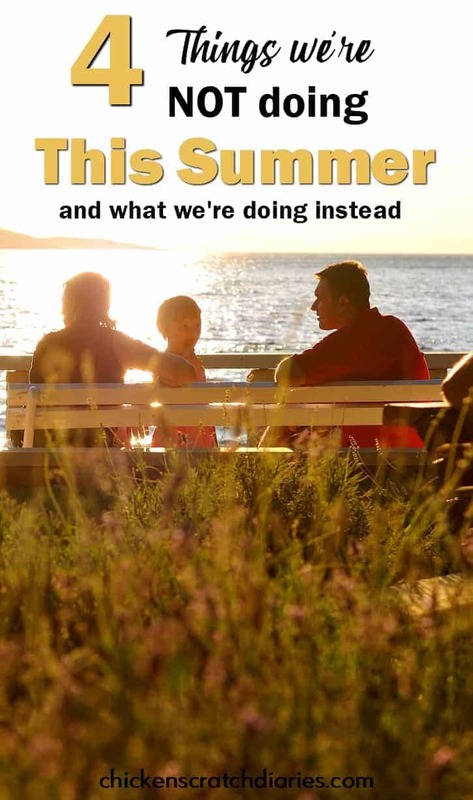 Let’s take control of our schedules, our summers, our lives (and our kids’) — and prioritize. But I firmly believe that it’s beneficial for kids to have ample time with their family, at home to just.be.kids. Some of my perspective on “doing less” has to do with having four children and trying to find time for each of them. For instance, even if my oldest daughter wanted to do four sports a year and two music lessons a week and it was affordable for us (thankfully she doesn’t so far), I think there’s an important lesson that kids can learn here. When you’re part of a family, everyone’s needs should be considered. Yes, the older the kids get, the more they want to do – but if it’s going to severely cut into our family time, church time or other things that we value as a family, then we don’t need to feel obligated to do these things. We can be more selective for the benefit of each family member and choose to balance how we spend our time, instead. Keeping it cheap and simple may not be everyone’s idea of summer fun. And I totally get the fact that some people thrive on their busy-ness and love it. But if your schedule is chaotic and you feel like summer is passing you by, maybe it’s time to let a few things slide off the calendar. For now at least. Your family can create memories in your backyard, at the dinner table, anywhere you’re together. The funny thing is that those small, unplanned moments are the ones my kids usually talk about the most later on. We’re also looking forward to spontaneous adventures like road trips to (local) state parks, the soda fountain, the zoo, and the like. We’re hoping that a low-key summer will help us to reach our budgeting goals – and keep us sane! What are you not doing this summer?